reminded me of this timeless, unforgettable form follows function; beauty in structure shed designed by the late Chicago architect Myron Goldsmith. What a perfect fit! Excitement when that beautiful plane enters that shed. A sense of completion. The shed’s straight lines contrasting with the curves and angles of the aerodynamic plane. To welcome the plane back home. To rest, before it takes off again. 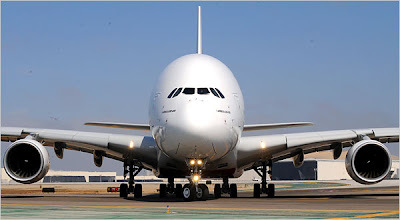 when asked to make a film for the TV series Building Sights about his favourite building, Foster chose a Boeing 747. This was a homage not just to the aerospace industry that has so inspired him, but to the big-spiritedness of US design, the American belief in getting things up and flying, of taking on daunting challenges in the belief that they will succeed. Ah yes, Boeing. They have their own Dreamliner coming out soon. Airbus has raised the stakes for design as a competitive tool and Boeing has understood. The 787 should be gorgeous. Look at that. All curves inside. That’s calming too. As is the lighting. 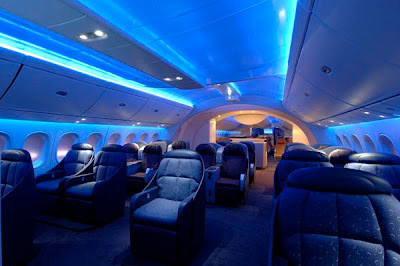 As in the A380 LEDs in the ceiling will give a sense of daylight or of a beautiful night sky. The L.E.D.’s that illuminate the cabin are programmed to wash the interior with colors that change subtly throughout the flight. Each shade is selected to create the ideal mood for a particular activity, like sleeping, waking or eating, regardless of time zone. I would feel peaceful too, watching a jumbo jet pull into Myron Goldsmith’s shed at San Francisco International airport. Like finding the perfect puzzle piece. Modernist perfection it is. Too bad it was demolished in 1996. I guess its perfect shape for 1958, when built, would hardly fit today’s larger aircraft anyway. What we build today is often too big. 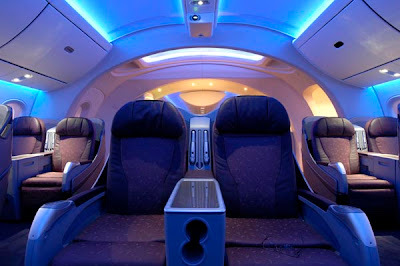 But I do find the new jets and their interior cabins thrilling. You are currently browsing the archives for the airplane category.